Environmental remains from archaeological sites provide important information about the long history of human-environmental relationships. The data derived from environmental archaeology research not only provides us with a rich cultural perspective, but is also a vital source of biodiversity research data. Biodiversity science typically relies on modern plant and animal data to define biogeographic distributions, however this modern data cannot tell us how biodiversity has changed over time, what the process of change has been, and most importantly, how to conserve biodiversity. Environmental archaeology provides the link between paleontological distributions (pre-human) and neontological ones (modern) by tracking the millennia of human impact on the plants and animals of our world. Embedded in the archaeological context of human activities, it can also inform us about how people typically interact with plants and animals, what people do in situations of resource abundance or scarcity or in times of changing climates or landscapes. From this source we can understand not only about past biodiversity, but also how to understand the link between humans, their decision-making processes, and co-evolutions between cultures and environments. ZooArchNet, in collaboration with VertNet, is an interdisciplinary effort to provide animal-related biodiversity data to all researchers and thus to bridge the gaps that exist between paleontological and neontological biodiversity research, and between the biological and anthropological disciplines. We publish openly accessible digital data from, and available to, any researcher anywhere in the world. ZooArchNet aims to mobilize data about archaeological animal remains in a way that best supports open data/open science approaches for both biological and anthropological research. 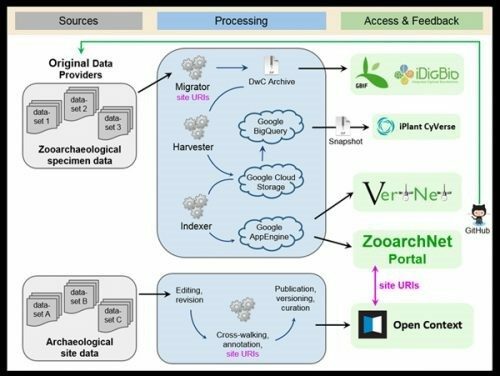 The ZooArchNet/VertNet team publishes zooarchaeological specimen data records in formats that allow these records to be shared as Darwin Core enabled datasets in open biodiversity networks (such as iDigBio and GBIF). The data records are also formatted using linked open data protocols and shared site and specimen identifiers, to allow sharing with archaeological publishers of open access data such as Open Context. The end result is maximally usable data adhering to archaeological and biological community standards, and with biodiversity and culture heritage information intact.